Circuit near Banja Luka running through a military training center, used for Yugoslavian local racing. 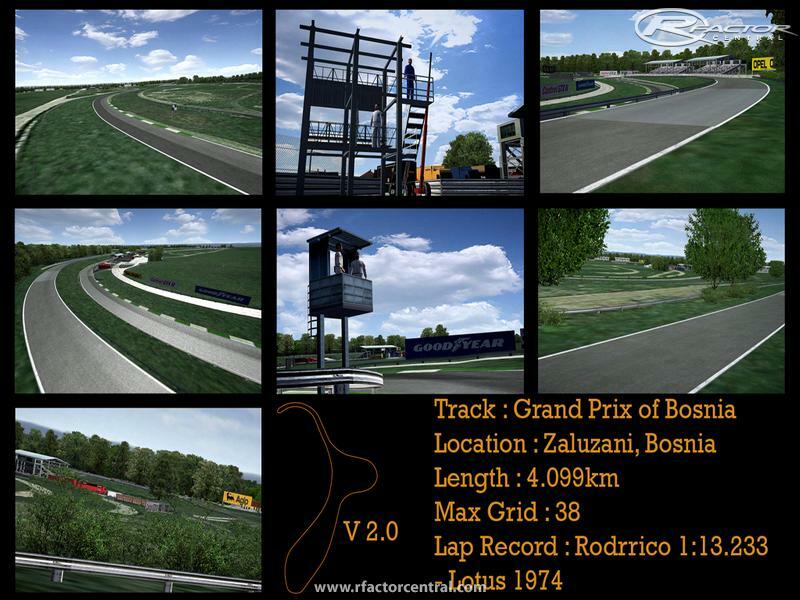 I have based the track design on Zaluzani in Bosnia. However I found the length to be a bit short and tight and therefore changed it to be much longer. The entire trackside objects are not to be based on the real track, only the basic circuit layout. I suggest using F1-1955, F1-1967, F1-1971 or F1-1975 for the best enjoyment of this track. Update to all the track objects and various other changes. An entirely new remake from scratch of my Zaluzani circuit. Now the circuit is far closer to its real world counterpart. I recommend the 1970s F1 cars for this circuit. There are currently no setups for Zaluzani Circuit. Add a Setup. 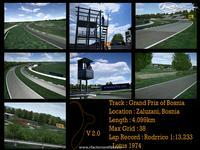 Hi everyone This is the Spa Francorchamps track with the Bustop Chicane of 2004 and 2005. It would be awesome if track looked like this in real life. In reality track is short, lap record is around 55 seconds, thight, almost without kerbs and with improvised pit and with small "grandstand". But really nice work, I enjoyed it a lot. If one returns to the stands, the turn is not taken into account. Why? Hello, Rod. I've just visited your blog... and I am curious, what do you mean 'drivable' walls?? Can we drive our car onto those walls or something? Nice track by the way, simple and fun. It is 4.099km I had packed and uploaded the file before noticing that I put the wrong loading screen in. If I make an update I will resize it.